Want to join me in A Thousand Words Thursday, read HERE then grab my tag from HERE. Wow, 8 years ago! That is insane, but she is so adorable! OMG she is cute. Really, really cute in a wow, I think she is cute and she isn't even my child kinda cute. Adorable! Love the little hat! What a little cutie she was (and still is, of course!) The big grin and little folded hands...and the hat and dress? How could you resist that! Does DQ like looking at old photos of herself? 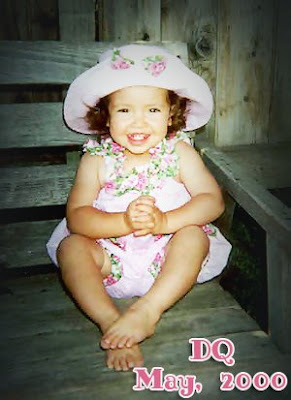 OMG that is the cutest photo of DQ, I love her outfit and hat - adorable!!! they grow so fast, no more blinking for you!! She could not get any cuter! Absolutely beautiful! She's beautiful. And she's grown a ton since then, too! Wowie!! For a second, I thought I was looking at your youngest daughter!! They look so much alike!